First things first…welcome to My Kitchen Serenity! I’m so glad you’re here. 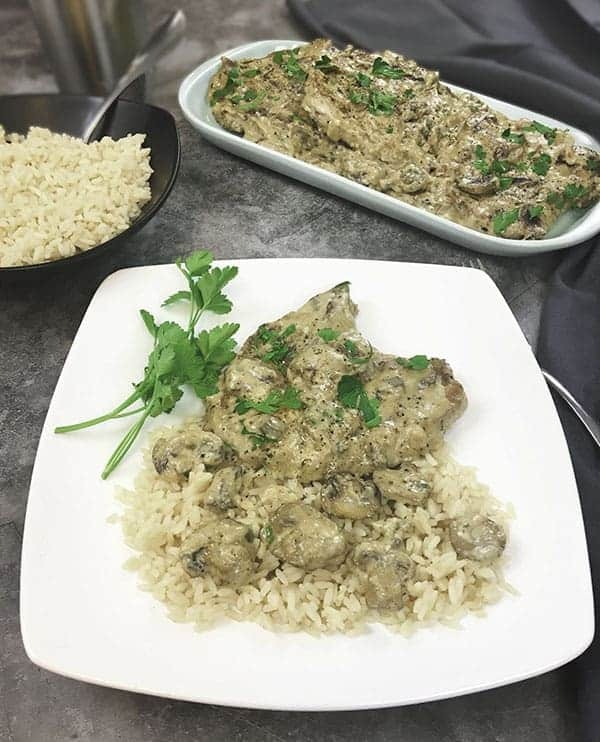 Let’s talk about these melt in your mouth Creamy Smothered Pork Chops! Smothered pork chops are classic Southern comfort food. 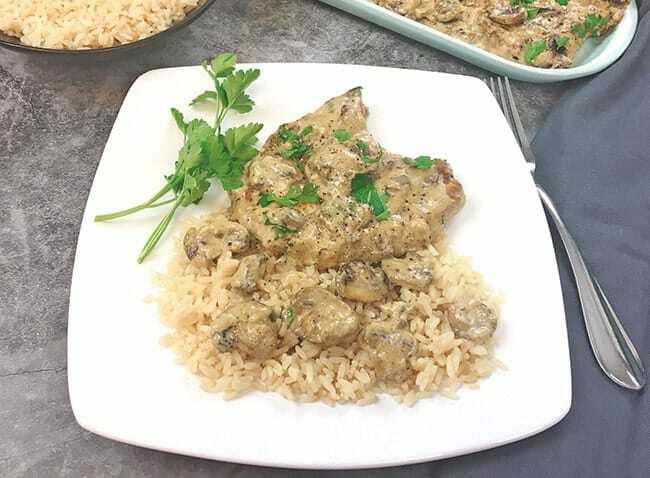 Pork chops are simmered on the stove and covered in a rich, thick gravy with fresh mushrooms (add sliced onions and bell peppers if you wish). This has been an easy family favorite meal for many years. 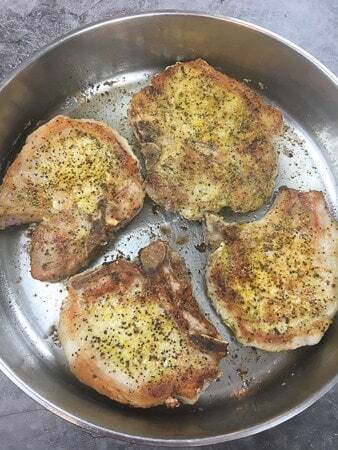 Bone-in pork chops are seasoned with lemon pepper, lightly floured, and then seared on both sides in a hot skillet. I like this skillet from Cuisinart because the base heats evenly and the handle stays cool! 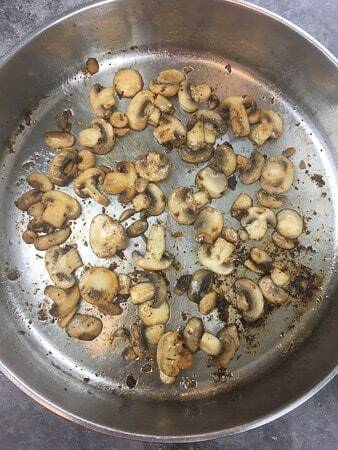 Remove pork chops from skillet and add fresh sliced mushrooms. Cook till tender; about 5 minutes. 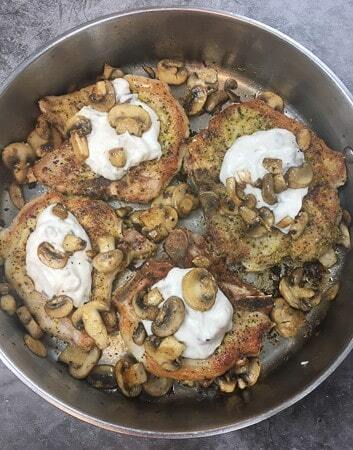 Return pork chops to the skillet and spoon cream of mushroom soup on top. 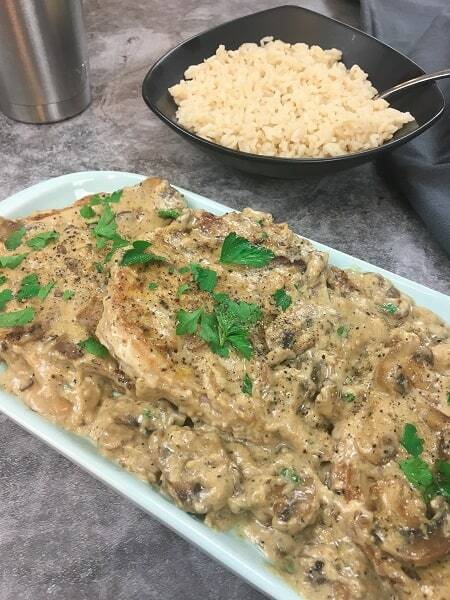 Simmer slow on low heat for about 40 minutes and you’ve got yourself fall off the bone tender pork chops with a thick, creamy mushroom gravy that’s perfect over rice or mashed potatoes. What Goes Good with Smothered Pork Chops? So, what is a good side to go with your smothered pork chops? This recipe calls for rice as a side dish and nobody loves rice more than I do! Potatoes, mashed or sliced and baked, go great with pork chops. Check out my Easy Parmesan Herbed Potatoes. They take about the same amount of time to cook as the pork chops. Very convenient! This Roasted Broccoli recipe from Southern Bite is also a great choice. Just pop it in the oven about halfway through the cooking time for the pork chops to ensure they’re both finished cooking at the same time. Why Use Bone-in Pork Chops? This recipe calls for bone-in pork chops because they tend to be more flavorful and less dry than boneless. Pork steaks are great to use as well. What Happens if I Undercook Pork? Undercooked pork carries the risk of you developing a foodborne illness. Use a meat thermometer to check the doneness of pork. Pork should be cooked to 145 degrees Fahrenheit with a 3-minute rest time. Since this recipe is slow cooked for 40-45 minutes, the pork chops will be perfectly cooked. What Happens if I Cook Pork Chops too Long? Nothing is more disappointing than overcooking a pork chop. Overcooked pork chops are dry and tough and nobody wants that! This recipe ensures moist, tender pork chops. 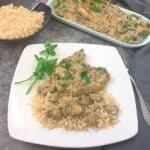 Can I Make this Pork Chop Recipe Gluten-Free? Yes, just skip the flour and use gluten-free cream of mushroom soup such as Pacific Natural Foods Organic Cream of Mushroom Condensed Soup; or make your own. I found this homemade, gluten-free cream of mushroom soup on the interwebs from The Spruce Eats. What are Some Mistakes to Avoid When Cooking Pork Chops? According to Southern Living, there are 7 mistakes to avoid when cooking pork chops. Check out their article to help make sure your pork chops turn out great! Season pork chops with lemon pepper then dredge in flour. Shake off excess flour. Add oil to large pan or skillet and brown the pork chops for 2-3 minutes. Remove the pork chops and drain on a paper towel. Add the sliced mushrooms to the skillet and saute for 5 minutes. Return the chops to the skillet and spoon the cream of mushroom soup on top of the pork. Cover and reduce the heat to a low, slow simmer. Cook for about 40-45 minutes. Serve on top of rice if desired. If you try this recipe and like it, please let me know by leaving me a comment. I’d love to hear from you.